Yes, that was “our” Qarl in that BoingBoing post earlier today. Gee, he’s not busy enough deforming mesh for fashion-forward avatars, he has to create a tiny model of his house as a snowglobe holiday gift for his wife. If you feel like sending him money to make you one, by all means… but some of you may be able to figure out his process based on his blog post. Posts about the mesh deformer were all over my feed, so when I saw the BoingBoing.net post about “A clever fellow named Qarl,” I knew it had to be him before I clicked the link. Sure enough, links to his Second Life projects are at the bottom of the page. Ironically, I bailed on a “Make a Prim Snowglobe” class last night inworld because I missed the first 8 minutes and couldn’t get started with the right dimensions for the base prim. I’ll try again later… future cloudy, though. 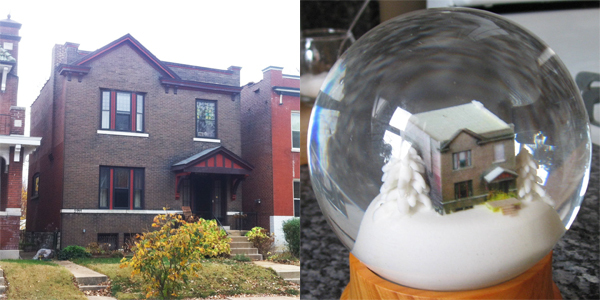 this year for christmas i gave my wife a special present: a snowglobe with a tiny copy of our home inside. she loves it. i love it. everyone loves it. so hereâ€™s how you can make one for yourself:1 order a custom snowglobe kit. ebay has a bunch to choose from. try to find one that tells you its exact dimensions so you can size your model before the globe arrives in the mail.